Shaun grew up in the Syracuse, Utah area. His grandfather was a painter for the Union Pacific R.R. working out of the Union Station. Shaun has a B.S. degree in Info Tech which is how he spends his working day with the L.D.S. church keeping the computers up to snuff. 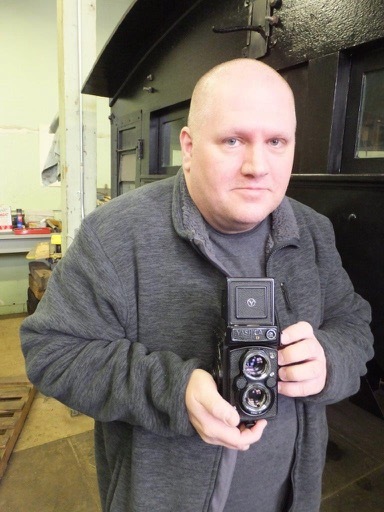 He was once the President of the Ogden Camera Club and still has a passion for photography. He has over 70 cameras which can easily consume his free time. It is photography that brought him to the shop. He was trying to use up a roll of film and knew about the shop, so he stopped by and has been making his talents useful ever since. He smiles when stating he doesn’t know one end of a screwdriver from the other but he tinkers with cameras so we think he can break down a steam engine in a pinch. He has no goal for his volunteer work at the shop but is bringing his talents to the community by writing articles associated with his pictures. He feels that this public information effort will enhance the community’s interest and perhaps its volunteer efforts. Shaun is impressed with the friendliness of the volunteers at the shop and how they go out of their way to inform the visiting public of the shops activities.